Companies like Airbnb and Etsy are redefining what it means to have a "job." Is that good for the economy? Last week, in the face of growing scrutiny from the city of New York, the five-year-old accommodation-sharing company Airbnb released some data designed to make its case as a good neighbor – even an economic catalyst – in the five boroughs. In the previous year, according to numbers crunched by the consulting firm HR&A Advisors, Airbnb had helped generate $632 million in economic activity throughout town, supporting 4,580 "jobs." Its hosts – individuals often held up as direct competition to major hoteliers – were making on average $7,530 a year renting out their homes. And the visitors they welcomed stayed longer (6.4 nights on average) than the typical New York tourist, and spent more money in the process ($880 at New York businesses). Micro-entrepreneurs are doing something so nontraditional we don’t even know how to measure it. But there’s also a much larger question lurking behind early data of this sort that's starting to trickle out of "sharing economy" companies. Exactly what is this entire industry doing to the economy? When people share and rent things instead of buying them, does that mean we need to produce less stuff, requiring fewer jobs, ultimately creating less economic growth? So how do you measure that impact when the standard definitions of "work" and "jobs" don't even apply? "The overarching question here is 'how much economic growth will be induced by the sharing economy?'" says Arun Sundararajan, a professor at the NYU Stern School of Business who has been studying the question. "Contained in that is the possibility that the sharing economy may not lead to economic growth." It’s notable that a company like Airbnb, at this stage in its evolution, is trying to put out data like this at all. Look back at Google circa 2003, Sundararajan says. The year before Google went public, the company was interested in trying to size up how large its market would be. It was interested in articulating its revenue model for the public. It was not all that interested in painting a picture of its broader impact on the world. But that’s not really an option for Airbnb or Uber, companies founded on tech platforms that are creating new, more efficient ways of doing what other people are already doing (and what regulators are already regulating). There’s a creative destruction element to the sharing economy that theoretically threatens hotels or cab companies, or even the auto manufacturers who used to build and sell cars to 25-year-olds who’d now rather use Zipcar instead. If something becomes better, people want more of it, not less. On the other hand, there are substantially fewer farmers than there were in America in 1900. But as farming became more efficient, people who once were farmers found other things to do instead (conveniently right around the same time as a massive expansion in secondary education). “So to think about things in a really static way – we have a certain amount of stuff, and if people are using it more efficiently, we need less stuff – it’s sort of myopic,” Sundararajan says. The sharing economy, however, is not exactly like economic disruptions that came before it. More complex technology typically demands more complex skills. And, in the past, major technological change in the economy has been accompanied by a shift toward higher-skilled work. Initially, there’s a shortage of those high-skilled people. Their wages go up, while wages go down for the people who are steeped in the old technology. The sharing economy is fundamentally premised on new technology, and it's creating new jobs exactly like this for the developers and programmers on the back end of Etsy’s platform or SideCar’s app. But that’s not the most interesting part of this story. eBay’s impact hasn’t been on the thousands of tech jobs it created for eBay, but on the hundreds of thousands of sellers it created. He’s wary of all the estimates he sees of the size of the sharing economy, or any projections for its future growth, because we also don’t know how quickly this new kind of consumption will become “normal.” This is a question of culture, not public policy. Everyone knows how to behave when you walk into a hotel. But most of us are still a little uncertain about what’s supposed to happen when we arrive in someone’s else apartment to rent a room for the night. That’s a sign that an idea like Airbnb hasn’t yet become legitimized. And the growth of the whole sharing economy – and its economic ripple effect – depends on the speed at which that happens. Sundararajan also suspects that many of these platforms are quietly operating as “finishing schools” for tentative entrepreneurs, another effect that so far hasn't been measured. You can test out selling some of your crafts on Etsy, for example, without quitting your job and cashing in your 401K to open a brick-and-mortar store. Whole new companies will start this way, he predicts. And that would have an impact on the economy, too, that would be inarguably positive. Sundararajan chuckles whenever New York City gets wound up about a new tech company relocating to town. Pull back and consider this network of uncounted jobs, sort-of-income, and tentative entrepreneurs all across the country, and a larger possibility emerges: Maybe the economy is doing marginally better than we think. Those stagnant jobs numbers that come out of the Bureau of Labor Statistics the first Friday of every month don’t account for much of this activity. 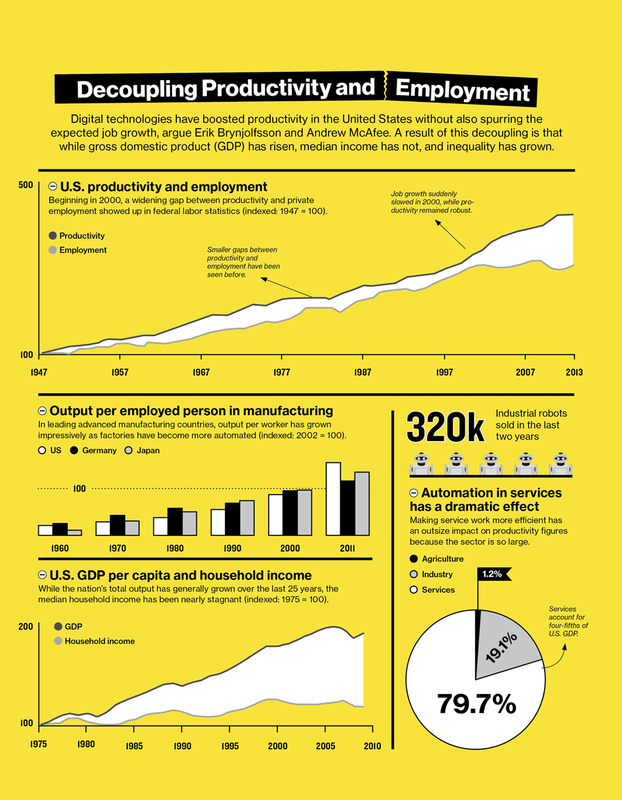 Earlier this summer, the MIT Technology Review published a startling article based on the work of MIT’s Erik Brynjolfsson and Andrew McAfee showing not only that technology was destroying jobs, but that productivity in America had recently become decoupled from employment. Traditionally, the two rise in tandem. As productivity increases, jobs increase, too. But amid the massive new wave of automation, starting around 2000, this has ceased to be true. That chart, from McAfee, shows the widening gap between productivity and employment in America (the pink arrow inserted is ours). This is deeply troubling to economists. But it’s possible – and this is what Sundararajan and others are hoping to measure – that the gap could contain all these people we are currently not counting. That's not to say that these unconventional workers fill up that entire gap, but they could be an important part of the picture. And if that turns out to be true, it should change not only how we think of people like the part-time Airbnb host, but also how we create climates that enable them. Take a person who was completely unemployed and now does some kind of work as a sharing economy supplier, maybe driving an Uber car, or providing services on TaskRabbit. If that person reports this new work for profit in a response on a BLS survey, they would be counted as an additional job. However, Sundararajan adds, unemployment (or employment) numbers reported by the BLS don't capture the additional "employment" or "work" generated by underemployed people who were already working at least an hour a week (like a software contractor who now also does Lyft on the side). Additionally, that data isn't good at reflecting people who dip into the sharing economy while holding regular full-time jobs (a lawyer who rents out a room on Airbnb, a furniture supplier who creates and sells his own work on Etsy on the side). It can't capture the effect when a previously existing small business owner now receives substantially more employment thanks to Etsy. It also can't tell us anything about one of Sundararajan's key questions: Are these micro-entrepreneurship platforms enabling people to create more traditional new businesses that wouldn't have existed without the launching pad of the sharing economy? Part of the challenge also lies in how people who do these activities think of them. Sundararajan worries that survey questions that ask about your "job," your "main job," your "other job," or your "business" may lead people in the sharing economy to under-report what they're up to simply because they don't think of their activities in those terms. A knitter on Etsy thinks she's selling the products of her "hobby." A driver on SideCar thinks he's taking gas money to drop people off while he's already on his way across town to his part-time job. And an Airbnb host doesn't quantify how many hours she spent last week "hosting" tourists from Chicago. Airbnb in particular leverages excess space, not excess time, making it difficult to measure that "work" in hours. The underlying point here isn't necessarily a critique of official statistics. Sundararajan believes the only way you measure the impact on the economy of this kind of technological change is to go to the source of the technology itself: these companies. Only they can answer how many sellers use their platforms, or how much money the average vendor is earning, or how many people are served by their products, enabling ripple effects throughout the economy. Which brings us back to our starting point: It's time for companies in the sharing economy to begin rounding up their own data.